Many unionists in North Down will have been appalled at the increasingly overt attempts by the local MP, Lady Sylvia Hermon, to subvert the will of the British people in relation to Brexit. Lady Hermon, like many remain MPs, cloaked these attempts in palatable language, however there is no doubt that the member for North Down’s real objective, in line with that of Sinn Fein, is to revoke Article 50. On Wednesday Lady Hermon brought forward a disgracefully anti-unionist motion in the House of Commons, which sought to protect the utterly failed political project which has acquired a label that is the epitome of moral blackmail- the ‘peace process’. The ‘peace process’ inextricably links peace to the political project, namely the Belfast Agreement, which is given effect by the Northern Ireland Act 1998. The purpose of this is clear, it is designed to send the message that peace is dependent upon acquiescence to the political project. This effectively ensures that any moral outrage or reprehensible act of appeasement can simply be justified and placed above criticism by filing it away under the heading- ‘to protect the peace process’. This great moral blackmail, of course, has another more sinister method of extracting concessions. If peace is dependent upon the political project, then this hands a veto to those that would threaten violence. Therefore all that has been required for the republican movement to extract political concession after concession, has been for them to remind everyone that we don’t want to go back and advise that a failure to accede to their latest demand threatens the ‘peace process’. Quite who would take us back is unclear. 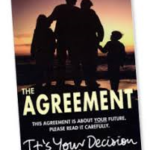 Supporters of the agreement assert that peace is dependent upon the political project, as a result this blackmails a great many people into supporting something that they know is morally and politically wrong, for what they reluctantly conclude is the greater good. And therein lies the great deceit at the heart of the ‘peace process’. In her comments yesterday Lady Hermon, in a most despicable attempt to manipulate the unionist community, justified the need, in her opinion, to protect the Belfast Agreement by stating that a failure to do so may encourage dissident republicans. Stop for just a moment and assess just how absurd that is. We must support a political project, because if we do not then republican terrorists may grow angry. Such a morally reprehensible argument has seldom been advanced within the Parliament of the United Kingdom of Great Britain and Northern Ireland. Lady Hermon further appeared to support the heinous proposal that had been put forward on Monday, namely for an economic United Ireland that would move the border to the Irish Sea, thus cutting Northern Ireland adrift from the rest of the United Kingdom. It is hard to recall a more overt attempt to wedge Northern Ireland out of the United Kingdom and chastise the British people of Northern Ireland along the rocky road to Dublin. The DUP, quite correctly, vetoed this ludicrous proposal. 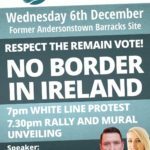 There will be many people within North Down now looking to the only realistic replacement for Lady Hermon, Alex Easton MLA, to provide a voice for those within North Down that support the union, that support Northern Ireland’s place within the United Kingdom and as such respect the democratic will of the British people that voted to leave the European Union. Mr Easton was the only candidate within sight of Lady Hermon during the last election, therefore many people in North Down will want to hear from the man that will undoubtedly be the DUP candidate for the next Westminster election. Many Unionists in North Down will, quite correctly, have had serious misgivings about the DUP. 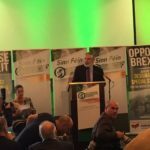 Many will have been deeply uncomfortable at the concessions previously awarded to Sinn Fein and indeed the implementation of the Belfast Agreement. However, it has been clear that the DUP have put the brakes on and adopted a much harder line. This must be welcomed and supported, with a watchful eye kept on the party to ensure that there is no backsliding to the period of roll-over unionism. In North Down Alex Easton provides the best opportunity for the unionist people to reclaim the seat for principled unionism. There is no unionist that could seriously have supported Monday’s proposal, as Lady Hermon appears to have done, and there are very few unionists that could in all conscience fail to see that the Belfast Agreement is a failed political project and as such the Northern Ireland Act 1998 should be repealed and replaced with a durable and robust system of Government based upon the will of the majority. It is of course interesting that almost all of those arguing for Northern Ireland to be battered out of the United Kingdom, and handcuffed to the Republic of Ireland, support the Belfast Agreement. Their argument for Northern Ireland having special status is the rather irrelevant point that a majority of the region voted to remain. However, when it comes to Northern Ireland’s governance they demand a minority veto in the form of mandatory coalition and deny the majority their right to select their government, as in any normal civilised democracy. They can’t have their cake and eat it. The vote to leave the European Union was a UK wide referendum. If we were to follow the special status argument to its logical conclusion then we would chop the United Kingdom up into towns and cities that voted leave or remain. The outcome of that would be preposterous. We would have, for example, North Down in the Customs Union and Single Market, and east Belfast outside of it. That idea is politically illiterate, naive and utterly ridiculous, isn’t it? It makes you therefore wonder why so many are continuing to advance such a baseless argument. Of course, Irish nationalism and the progressive left have always wanted to demolish the strength and independence of the United Kingdom . They cherish weakness and despise strength. They cheer on the unelected political super state of the European Union and side with them against their own Parliament. June 23 2016 was Britain’s Independence Day and it falls to the British people to ensure that those elected to serve, respect the will of the people. 176 Responses to "Lady Hermon’s despicable attack on Unionism should see her ousted by the people of North Down"
Hi there, There’s no doubt that your website may be having internet browser compatibility problems. compatibility issues. Whenever I take a look at your blog in Safari, it looks fine however, when opening in I.E., it has some overlapping issues. Any way I will be subscribing in your feeds and even I fulfillment you access constantly rapidly. means? I have a challenge that I’m simply now running on, and I’ve been on the glance out for such info. IE nonetheless is the market chief and a good section of other people will pass over your magnificent writing due to this problem. checkbox and from now on each time a comment is added I receive 4 emails with the exact same comment. article is actually fruitful in support of me, keep up posting such articles. else having similar RSS issues? Anyone that knows the solution can you kindly respond? This post is actually a good one it assists new the web users, who are wishing in favor of blogging. you’ve bought here, certainly like what you’re saying and the best way during which you say it. no longer actually a lot more smartly-appreciated than you might be now. of this subject, made me for my part imagine it from numerous varied angles. Moreover, The contents are masterpiece. you’ve performed a great task on this subject! Hi, just came across this web page. Its a fantastic illustration of how small to medium sized companies can use Awards based promotion to get their companies recognised on the 1st page of Google. Awards programmes offer many benefits to participants. After all they bring publicity and you can share the news of your win with your employees, clients, industry peers and target market as many times as you like. Additonally awards offer prestige and status, giving potential prospects peace of mind that they are working with a reputable company. There are many types of awards programmes, including those that host awards ceremonies (and you pay per table), organisations that award only their members (and you pay for membership and advertising) and those that provide promotional materials. The latter is a great choice for those who are unsure about the benefits of using corporate awards programmes because generally nominees and winners do not have to pay a penny to be involved. Participants often receives online recognition, usually with a reach much greater than their own marketing efforts can offer. Other free benefits can include the use of an announcement. Most participants have the option to purchase additional marketing materials to further enhance their win, if they wish to, for use in social media campaigns, on their own website, email marketing campaigns or in customer newsletters. whoah this weblog is fantastic i really like studying your posts. Keep up the great paintings! You realize, lots of individuals are hunting round for this info, you can help them greatly. My spouse and I absolutely love your blog and find a lot of your post’s to be just what I’m looking for. Would you offer guest writers to write content available for you? I wouldn’t mind creating a post or elaborating on a lot of the subjects you write about here. Again, awesome weblog! Needed to create you the little bit of note so as to give thanks again for your personal beautiful principles you have featured above. It was quite tremendously generous with people like you to allow unhampered what exactly a lot of people could have supplied as an e-book to help with making some money on their own, notably considering that you could have tried it if you ever decided. These solutions additionally acted like the great way to be sure that many people have a similar desire just as mine to know whole lot more in regard to this condition. I believe there are thousands of more pleasant periods in the future for individuals that start reading your blog. My programmer is trying to convince me to move to .net from PHP. I have always disliked the idea because of the expenses. But he’s tryiong none the less. I’ve been using Movable-type on a number of websites for about a year and am anxious about switching to another platform. I have heard great things about blogengine.net. Is there a way I can import all my wordpress posts into it? Any help would be really appreciated! I am really impressed together with your writing skills as well as with the structure on your blog. Is that this a paid subject or did you customize it yourself? Anyway keep up the nice high quality writing, it is uncommon to look a nice blog like this one these days.. I do trust all of the ideas you’ve presented to your post. They’re really convincing and will certainly work. Nonetheless, the posts are very quick for starters. May you please lengthen them a little from next time? Thanks for the post. I’m still learning from you, as I’m trying to achieve my goals. I certainly liked reading everything that is written on your site.Keep the tips coming. I loved it! Hiya! I know this is kinda off topic nevertheless I’d figured I’d ask. Would you be interested in exchanging links or maybe guest authoring a blog article or vice-versa? My blog discusses a lot of the same subjects as yours and I think we could greatly benefit from each other. If you happen to be interested feel free to shoot me an e-mail. I look forward to hearing from you! Terrific blog by the way! Pretty great post. I simply stumbled upon your weblog and wished to say that I have truly loved surfing around your blog posts. In any case I’ll be subscribing for your feed and I hope you write once more soon! Youre so cool! I dont suppose Ive read anything like this before. So nice to find any individual with some authentic thoughts on this subject. realy thank you for beginning this up. this website is one thing that’s wanted on the net, someone with slightly originality. helpful job for bringing something new to the web! I was recommended this blog through my cousin. I am no longer certain whether or not this post is written through him as nobody else understand such detailed approximately my trouble. You’re incredible! Thanks! One thing I want to say is that before obtaining more computer memory, take a look at the machine in which it could well be installed. When the machine is definitely running Windows XP, for instance, the memory threshold is 3.25GB. Installing over this would purely constitute any waste. Make sure that one’s mother board can handle this upgrade amount, as well. Good blog post. I am typically to running a blog and i actually respect your content. The article has actually peaks my interest. I am going to bookmark your site and keep checking for new information. Hello There. I found your blog the usage of msn. That is a very smartly written article. I will be sure to bookmark it and come back to read extra of your helpful info. Thanks for the post. I will definitely return. Hello! Quick question that’s totally off topic. Do you know how to make your site mobile friendly? My site looks weird when browsing from my iphone4. I’m trying to find a theme or plugin that might be able to fix this problem. If you have any suggestions, please share. Many thanks! Great blog post. What I would like to bring about is that laptop or computer memory must be purchased in case your computer still can’t cope with everything you do along with it. One can set up two RAM boards with 1GB each, by way of example, but not certainly one of 1GB and one of 2GB. One should make sure the car maker’s documentation for one’s PC to make sure what type of storage is needed. Greetings from Colorado! I’m bored at work so I decided to check out your site on my iphone during lunch break. I enjoy the knowledge you present here and can’t wait to take a look when I get home. I’m surprised at how fast your blog loaded on my phone .. I’m not even using WIFI, just 3G .. Anyways, very good blog! One thing I would really like to say is that often before purchasing more computer memory, look into the machine in to which it is installed. If your machine will be running Windows XP, for instance, the particular memory ceiling is 3.25GB. Setting up greater than this would basically constitute any waste. Make sure that one’s motherboard can handle your upgrade quantity, as well. Good blog post. We absolutely love your blog and find a lot of your post’s to be what precisely I’m looking for. Do you offer guest writers to write content for yourself? I wouldn’t mind creating a post or elaborating on a number of the subjects you write concerning here. Again, awesome web site! “pop”! Your content is excellent but with pics and clips, this site could undeniably be one of the most beneficial in its niche. Yahoo’s home page and see how they create post titles to get viewers interested. put a brand new spin on a subject that has been written about for many years.